Evidences of a changed earth in 33 AD. Just after Jesus’s death on Calvary’s cross, the most spiritually impacting of all dispensational changes occurred … God’s primary focus transitioned from Israel to the Body of Christ–Christians throughout the world. Eventually this remarkable period, called the “Church Age,” will end with the departure of the Holy Spirit and God will again go back to making Israel as His primary focus. But currently, the Church Age, in which we live, began with quite unique and powerful characteristics. Here are three evidences of this historical and monumental change that happened in 33 AD. 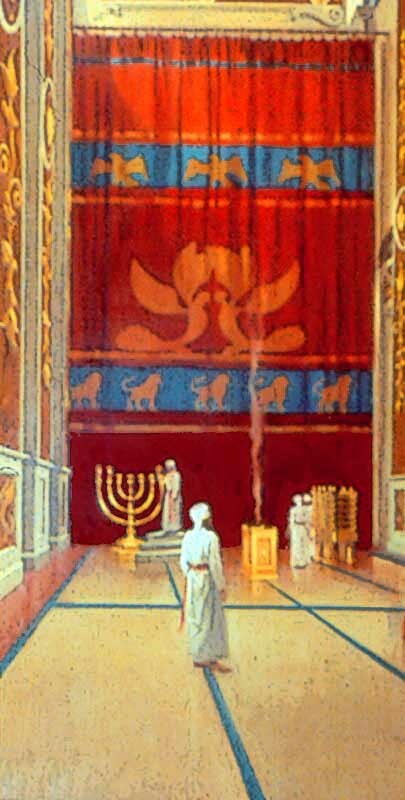 The 4″ thick, 60′ high and 30′ wide curtain that ripped in the Jewish Temple from top to bottom, exposing the private Holy of Holies area, was the visual indicator that the blood of Jesus had been accepted as payment for sin. There was now no more barrier to accessing the God of the universe. It’s amazing to think that for some 4,000 years, Adam, Moses, Noah and every other Believer saved by faith through the ages was barred from heaven due to the stain of sin. 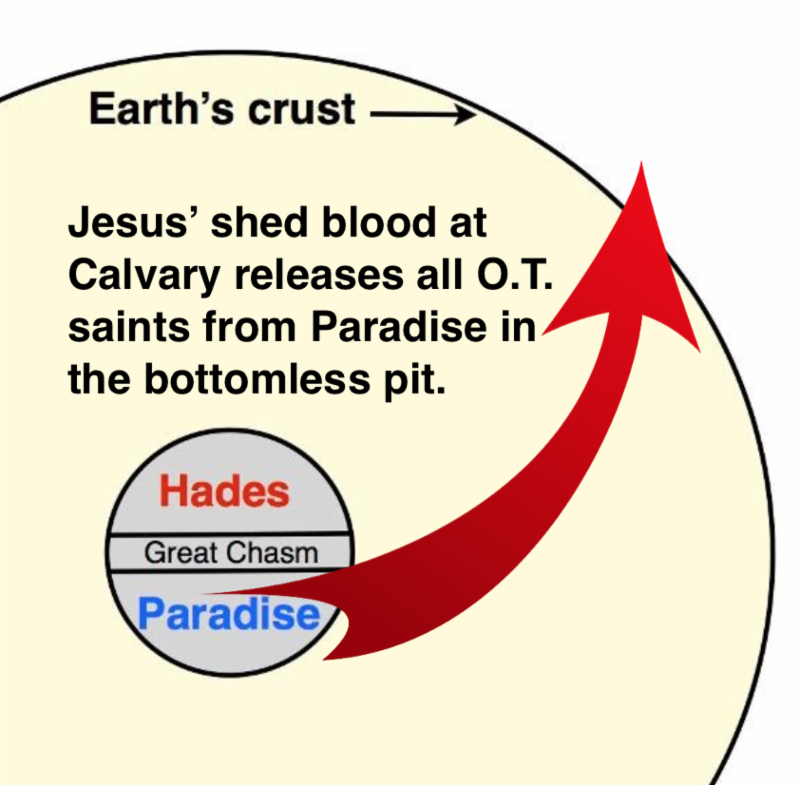 Finally, when Jesus died, this huge group of Believers made a mass transfer from Paradise, in the center of the earth, to the real heaven above. As the multitudes broke though the earth’s crust on their exciting journey, some even lingered a bit on the earth’s surface, to the bewilderment of those still alive on the earth. So things had changed. God did not change, but He was changing the way He dealt with mortal man. Before the cross, no one could go to heaven due to their sin. Now of course, when a Believer dies, their spirit goes directly to heaven…made possible because of the shed blood of Jesus. Just before Jesus departed this earth, He told the disciples to wait for the Holy Spirit to come and permanently indwell Believers. 50 days after His death, on the Jewish Feast Day of Pentecost, the disciples were gathered in Jerusalem, probably near an entrance into, or possibly on, the Temple Mount. 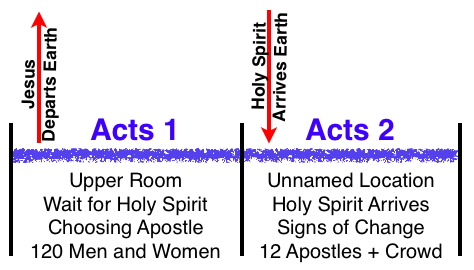 People have often assumed the “upper room” in the Acts 1 account of choosing a new disciple to replace Judas was the same room in the Acts 2 account of the arrival of God’s Holy Spirit. But a careful reading of the text makes no such definitive assertion. Although it is usually assumed and taught that this place is the upper room of Acts 1, the text doesn’t say that. It only says “in one place.” Scripture suggests a lower room on the ground floor that could be observed by people outside in the street seeing the faces of those inside well enough to identify that they were Galileans inside. And in verse 2:14 Peter refers only to the 12 apostles who were present. So it was in this ground floor room where the God of the universe first permanently indwelled humans… beginning with the 12 Apostles. He did not indwell hundreds of people on His initial arrival, only the twelve Apostles. This was a loud event…all of Jerusalem could hear the “sound” of God’s Spirit’s arrival. Then, those nearby the disciples’ gathering place saw and heard “signs” that this was something new from the Lord. 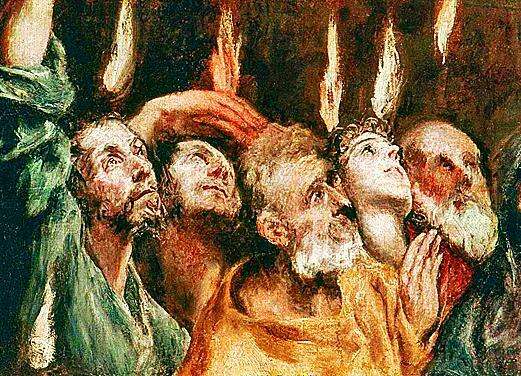 The three recorded signs of the Spirit’s coming–wind, fire, and inspired speech–are considered in Jewish tradition as a sign of God’s presence. 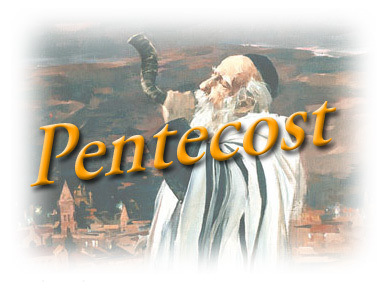 Wind (pneuma) is associated with God’s Spirit (Ezek 37:9-14). Fire from heaven is always an attention grabber (Sodom and Gomorrah, Elijah calling fire down from heaven, etc.). And speech alterations once began a whole new dispensation at Babel. So a first-century Jew knew full well this was something very powerful from heaven above. God was making the statement that things had changed. God did not change but He was changing the way He dealt with mortal man. Now there were Jews living in Jerusalem, devout men from every nation under heaven. And when this sound occurred, the crowd came together, and were bewildered because each one of them was hearing them speak in his own language. Acts 2:5-6. To further establish this “things have changed” moment, God had the disciples each speaking in a different language. Only the disciples were doing this, not others observing the Apostles strange behavior. Due to so many people in town for the Feast of Pentecost, there were visitors from all over the Mediterranean. And these visitors were dumbfounded that these men from Galilee were speaking in their native tongues. The Romans, Greeks, Arabs, etc., all heard an uneducated Galilean Apostle of Jesus speaking in their native tongue. The diverse and culturally mixed Jewish crowd was mesmerized by what was happening, and quite curious. The third evidence that God was changing how He dealt with humans was evidenced by visible observations. The apostles began speaking in foreign languages. Those observing first thought they were drunk. But Peter explained things more thoroughly. Peter corrected their assertions of drunkenness and presented them with the Gospel, the good news about who Jesus was, what He did, how He was killed and that He rose from the dead. It was at this time that individuals responded to the conviction of the Gospel Truth and received the gift of the Holy Spirit. Peter shared the simple Gospel message that God had sent His Messiah to redeem sinners. If you “Believed” your sins would be forgiven and you would permanently receive the gift of the Holy Spirit. This permanently indwelling Spirit from God, the third part of the Triune God now able to live in humans, births a new creature on arrival. 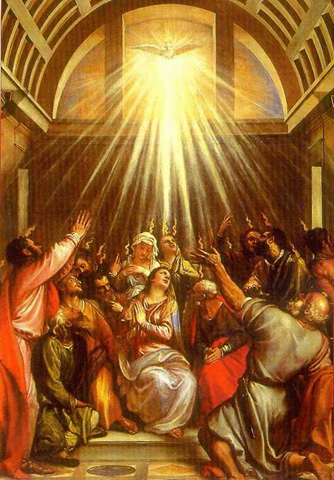 When the Holy Spirit comes into our lives, He illuminates scripture, heightens spiritual sensitivity and gives us access to an unequalled power source from above. Lives are changed. The 3,000 people who were saved that day had responded to Peter’s invitation to trust what Jesus had provided via the cross. There is no evidence that these new Believers spoke in other languages, known or unknown. Only the 12 Apostles were exhibiting signs. 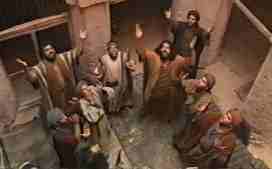 > With Jesus’ 12 Apostles loudly receiving the Holy Spirit in Jerusalem. > The event drew a street crowd giving Peter the opportunity to share the Good News of Jesus’ birth, death and resurrection. > Many responded to the Good News and were saved, the same way people get saved today, by Believing the Gospel. 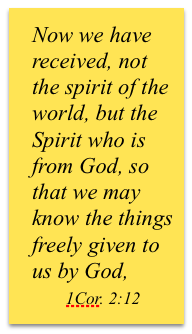 God’s Spirit entered each new Believer, permanently, when they Believed. And, just saying, if the Holy Spirit came so very loudly to earth when He arrived and infilled only 12 people, then the Holy Spirit’s departure, with millions of Believers in tow, will be ear-splitting! There will be no doubt to all those left behind that God is again changing how He deals with mankind.